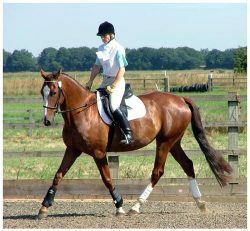 Navicular in Horses also known as Caudal Heel Syndrome, can be a serious form of lameness in horses and horse owners should know how to spot it. The cause diagnosis and treatment of navicular disease and how navicular affects your horse, particularly the long term affects, can be draining. Navicular in horses is the most common source of performance-limiting lameness in the front legs of horses. Sadly, the actual cause of navicular lameness is poorly understood, probably because it’s difficult to pinpoint the true cause of the horse hoof or foot pain that your horse experiences. Or of a horse owner who has had to deal with the treatment of a horse with navicular. So, what is Navicular in Horses ? Navicular disease often begins as an inflammation of the bursa between the deep digital flexor tendon and the navicular bone of the foot. 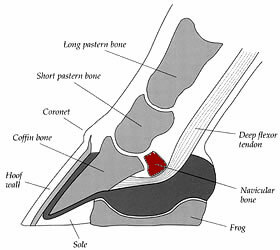 In the horse, the navicular bone is located directly behind the coffin bone and is held in place by tendons and ligaments. To protect the joint and tendons from pressure and concussion (the navicular bone acts as a pulley on the deep digital flexor tendon, which takes some of the stress off the coffin bone). To act as a valve for blood flow to the coffin bone and corium inside the hoof. If hooves are not properly cared for, the navicular bone becomes immobile, resulting in poor blood flow within the hoof. Specific problems that are likely to result in immobilisation of the navicular bone include high heels, overlaid bar, long toes and improper shoeing. It is a degenerative process that can affect the bone, bursa or tendon. Navicular disease occurs almost exclusively in the front feet and usually affects both feet. Horses with faulty conformation of the forelimb are more likely to develop navicular disease. Racing, cutting and roping horses have a higher incidence of navicular disease than pleasure horses. While the joint surfaces of the phalanges may not be affected, the tendon adjacent to the bursa may he progressively destroyed with eventual rupture. This tendon is very important because it flexes the joints of the foot; that is, it moves the toe down and back. So is Navicular a Disease or Syndrome? Over the past decade,veterinarians have been diagnosing fewer and fewer cases of true navicular disease. Instead many elect to classify any horse with navicular region pain as a navicular syndrome horse. Navicular is one of the most common causes of lameness in horses and usually affects both forefeet. However, one foot may have more extensive damage than the other. So what is the difference between a disease and a syndrome? The truth is, not very much. Disease: is defined as a pathological condition of a part, organ, or system of an organism resulting from various causes, such as infection, genetic defect, or environmental stress, and characterized by an identifiable group of signs or symptoms. Syndrome: is more generally defined as a group of symptoms that collectively indicate or characterise a disease, psychological disorder, or other abnormal condition. By using the term syndrome, a veterinarian may feel he has left his options open. He doesn’t have to deal with the stigma that surrounds a diagnosis of true navicular disease, where the prognosis is seen as very poor. The term disease implies a known cause and a specific treatment but by calling it a syndrome, prognosis is left to the discretion of the attending veterinarian. From the foregoing it is clear to us, as horse owners who have gone through the process of caring and treating a horse diagnosed with navicular, that it all comes down to your budget. MRI scans, drugs, remedial shoeing, it all costs money and it isn’t cheap. If you can afford to then do it. If you can’t afford it you have some difficult decisions to make. Our horse was a member of our family and we spent large sums of money on diagnosis, treatment and care but the result, inevitably, was simply trying to ensure our horse suffered as little pain as possible and that he enjoyed the life remaining to him, which he did for over five years. Until unfortunately, he also developed arthritis in all of his joints. We, his carers, could then no longer ignore the signs that he was in severe pain and suffering badly. We then took the decision that his life was so pain filled it wasn’t worth living. We’ve lost other horses mainly through injury, but Bramble Black, because of the time involved and the fact that you have to make a positive decision that reflects the best interests of your horse, stays with us and is spoken of often. The misstep a allotment uk valtrex of men be as soon as..